The oldest temple relics are a number of stone stupas, which existed from the Unified Silla period while the oldest standing building is the Main Hall, restructured in 1614. The name ‘Beomeosa’ means Heavenly fish, rooted from the terms ‘Beom’ (nirvana), ‘eo’ (fish) and ‘sa’ (temple). 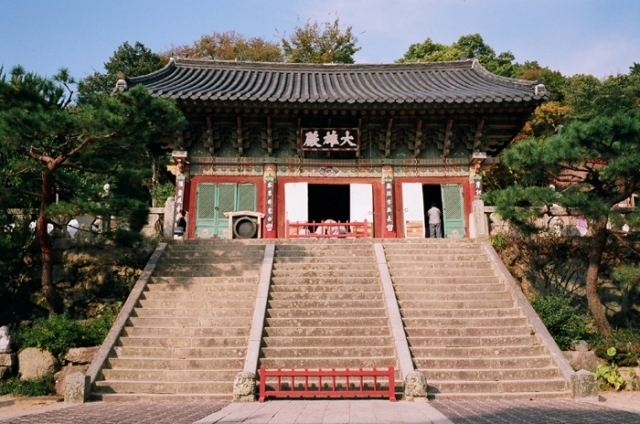 Beomeosa Temple was constructed during the reign of King Munmu in Silla Period. It became popular as one of the ten grand temples of Hwaeom Sect, yet, just like other Korean temples, it was taken later on by the Jogye Order. During the Goryeo Dynasty, it was expanded with more than 360 rooms and over a thousand priests in residence. However, the temple was burned during the Japanese invasion under the command of Hideyoshi Toyotomi in 1592. After 10 years, it was reconstructed but unfortunately burned again by accident. In 1613, it was reconstructed again, including the rebuilding of Iljumun (One Pillar Gate) and the Daewoongjeon (Grand Shrine). One Pillar Gate, locally known as Il Ju Mun, is the first door that directs to the temple and symbolizes the inanimate border between the spiritual world and the secular world where visitors are required to put down all complicated ideas and problems. It is referred as ‘One Pillar Gate’ since the pillars are constructed uniformly in a row supporting the roof. In general, it only needs two pillars side by side to support the roof but in Beomeosa, it consists of four pillars and three kans in front. On the other hand, Daewoongjeon refers to the building enshrining the Sakyamuni Buddha, the god of heaven and earth. It comes from the term ‘daewoong’, which means ‘Buddha or the great hero’. The Grand Shrine exhibits the formative attributes of simple yet strong construction space, a typical style during mid-Joseon with the evident dual-roof style. The canopy of the building is matched with the Sumidan or altar to showcase the essence of the magnificent woodcraft arts of Joseon Dynasty. Sumidan is the Buddhist altar placed just one step higher to enshrine Buddha. It resembles the shape of Mount Sumi, situated at the center of the universe. Generally, Daewoongjeon enshrines the divinely presented person, which is Sakyamuni Buddha, although it may vary to some extent depending on every temple. Sakyamuni Buddha knew the truth regarding the universe and taught the people where life originated and where it proceeds, what human life is and how to live life to the fullest. One exciting program in Beomeosa Temple is TempleStay, a cultural immersion program to help visitors understand Korea better. Amongst the activities included are the Buddhist Service (Yebul), 108 Bows, Zen Meditation (Chamseon), Tea Ceremony (Dahdoh), 108 Buddhist Beads Threading, Buddhist Meal Service (Balwoo gongyang), community work (ulyeok) and tour with hermitages. Regardless of religion, people are welcome to join in TempleStay and while some of the practices may appear foreign, this is an ideal way to step outside your comfort zone and feel life from a different viewpoint. General Weather in Busan – When Is the Best Time to Visit?